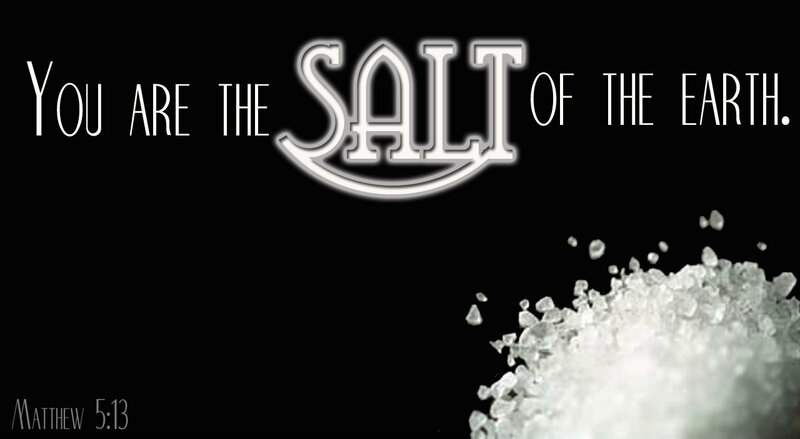 MATTHEW 5: 13 In my culture,salt is something that is so common and that we hardly notice it, unless you're on a salt-free or reduced salt diet. We put it on everything from cooked meals to fruits that are not ripe. Why? Because it makes things taste better. That's one of the natural qualities of salt. It is a seasoning that enhances the flavour of food. It's also a preservative. Before refrigeration or canning, most meat was preserved in one of two ways. It was either dried and smoked or it was packed in salt. Packed in salt meat would last for years. It was a preservative. Salt is also a curative. It has medicinal qualities. Before the time of modern medicine, salt was used as an antiseptic. Sometimes a concoction of salt and lime (vinegar) was used for the same purpose, to clean and purify the wound so it would heal quicker and cleaner. We're called to be the "salt of the earth." In other words, we're called to be a seasoning that enhances the flavour of life through the living out of our faith. We're called to be preservatives that help preserve the Biblical standards of morality. And we are called to be a curative. We have a message of hope and forgiveness from a Saviour that can bring healing to all of the hurts in this world. We know all of these but there's one more aspect to salt, too. A group of young people were discussing the text, "You are the salt of the earth." They came up with the same answers we did: "Salt enhances flavour. Salt preserves from decay. Salt helps heal." Then a young girl spoke up and said, "Salt creates thirst." The room suddenly got quiet. Everyone was thinking, "Have I ever made anyone thirsty for Jesus?" We're called to be the salt of the earth. We're called to season the world with the flavour of Grace. We're called to help preserve the world from decay. We're called to help bring healing. And we're called to make people thirsty for Jesus. PRAYER: Lord, thank you that you have called us the salt of the earth.Help us to be salty.Let us bring out the flavours of righteousness, love, and mercy in this world.